When you receive funds to your Paxum Checking Account you have multiple withdrawal options; Wire, Check, EFT, to an already existing credit/debit card, and to the Paxum Card. 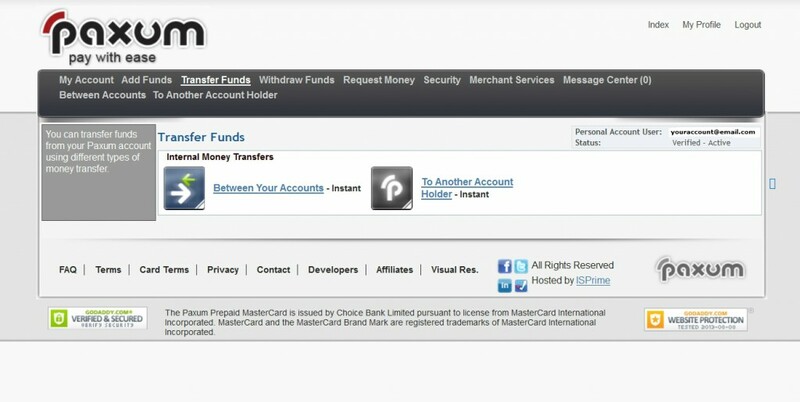 Many clients also use their Paxum Checking funds to send Instant P2P payments to other Paxum Account Holders for goods and services such as hosting, traffic, domains, etc. With the Paxum Card you gain instant access to your funds anywhere in the world, and remember since transfers to the Paxum Card are all INSTANT, you don’t have to wait at all to put that cash in your hands! On this page we will provide you with an instructional tutorial accompanied by screenshots to show you how to easily transfer funds instantly to your Paxum Card. 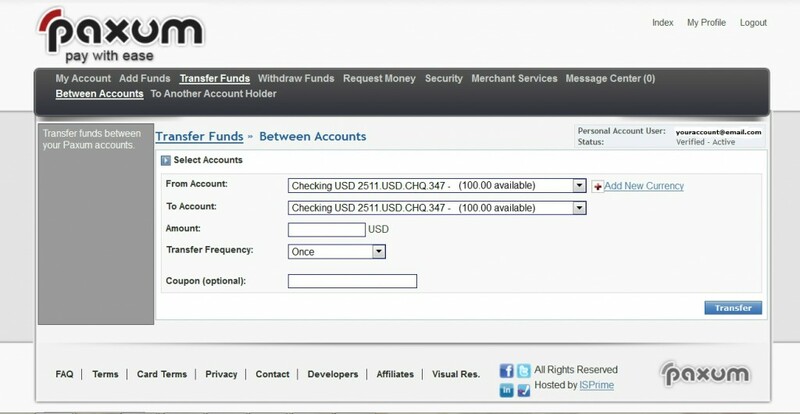 To send funds to your Paxum Card click BETWEEN YOUR ACCOUNTS. 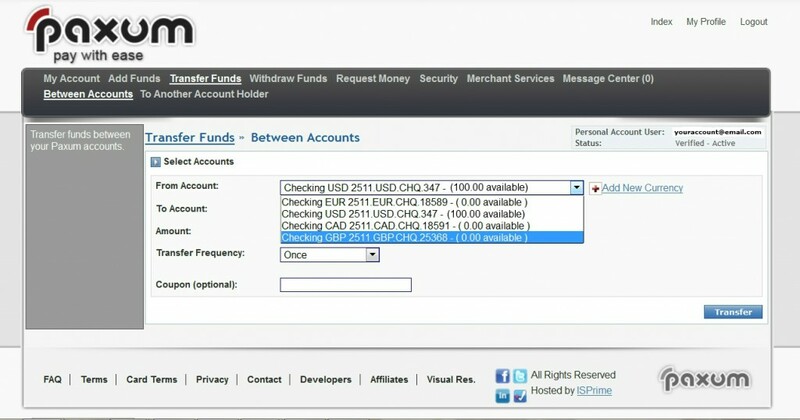 By default both From and To Account fields are pre-filled with Checking USD. 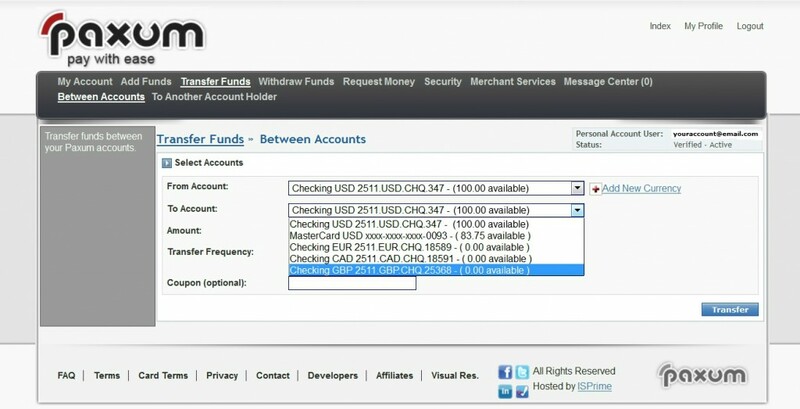 To transfer funds to your Paxum Card you must first select the CHECKING USD account in the From Account field as Paxum Card’s are currently only available in the default USD currency. In the next field To Account you need to select CREDIT CARD USD from the drop-down menu. Once the correct From and To accounts have been selected you now need to input the AMOUNT (in USD) that you wish to transfer to your Paxum Card. Next in line is TRANSFER FREQUENCY. This is a useful option if you wish to schedule regular transfers of the same amount to your Paxum Card. From the drop-down menu you can select one of multiple options. Once, Every Week, Every Two Weeks, Every Month, Every Three Months, Every Six Months, or Annually. By default “ONCE” is pre-filled in this field. Once you’ve selected the From Account, To Account, inputted the Amount to transfer and selected the Transfer Frequency (if applicable) then the final field is titled COUPON (Optional). 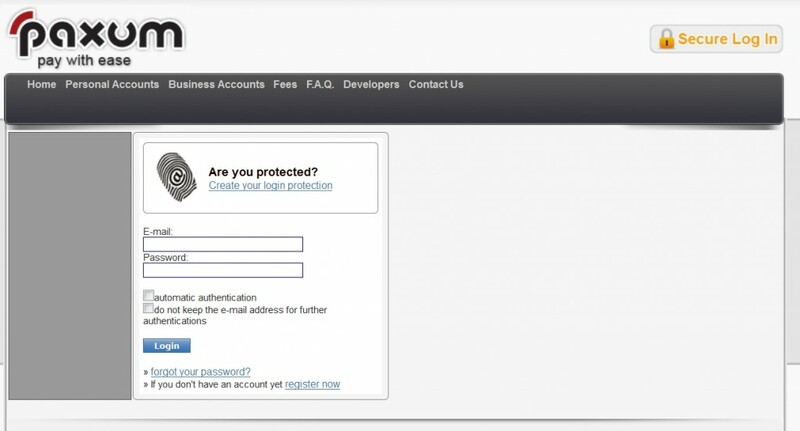 If you have received a coupon from someone at Paxum that provides free transfers to your Paxum Card, then this is the field where you can input that coupon code. Please note: if you have Transaction Approval Codes ENABLED for your account then you will also be requested to provide a specific code from the Approval Code Table in order to finalize the transaction. Now all you need to do is click the blue TRANSFER button in the bottom right corner and the funds will be instantly transferred to your Paxum Card. Those funds are immediately available for use through either ATM withdrawals or POS (point of sale) purchases at stores or online. We hope this instructional tutorial accompanied by screenshots has assisted you in your efforts to instantly transfer funds from your Paxum Checking account to your Paxum Card!